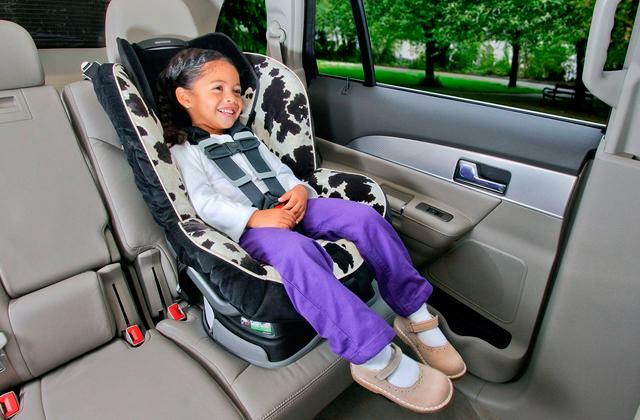 Rotating wheels, a footpad with a road print, and other elements will allow your little one feel like a real driver. It'll take you some time to assemble the walker. The My Child Coupe Baby Walker with removable interaction panel will not only help your kid safely explore the world but also entertain him/her. Choose either pink or black-and-red model. 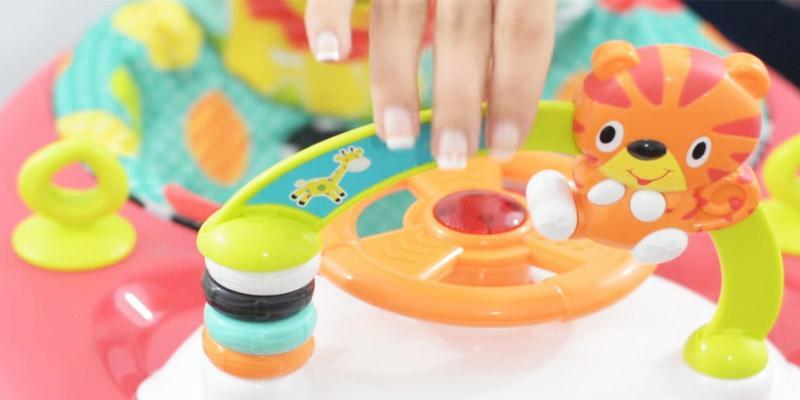 Even if you remove an interactive pad, two toys will still remain on the walker, so your kid will never get bored. You need to put some effort to install the toys on the sides. Choose this wonderful My Child Walk-n-Rock, and you'll provide your 6-month (and older) child with a variety of ways to develop and have fun. The electronic bear toy tray with sounds and manual activities will develop your child, while a teething toy will help alleviate unpleasant teething period for him/her. Front wheels jut forth a bit. 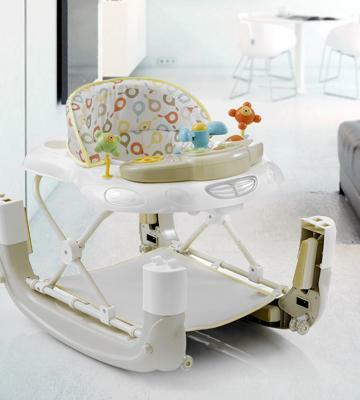 With the Bebe Style Baby Walker, your kid's walking experience will be much more enjoyable and less stressful. A padded abdominal protection together with a rigid backrest will provide additional safety. This lightweight and compact walker can be used at home and elsewhere, owing to its great portability and foldable design. Might stagger on carpeted flooring. Once your baby learns to sit up unassisted, this walker will become your irreplaceable helper. Child-friendly toys will amuse and develop your toddler, while you will have the option to choose a colour pattern you like better. Beautiful design, suitable for both boys and girls. Features 3 adjustable height settings and an interactive panel for both, use on the go and on the floor. While growing, those children who are naturally taller than most average kids may find it a bit inconvenient to sit in. 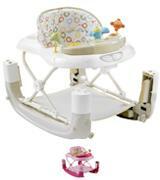 A good and cost-effective baby walker with all expected functionality and safe options. 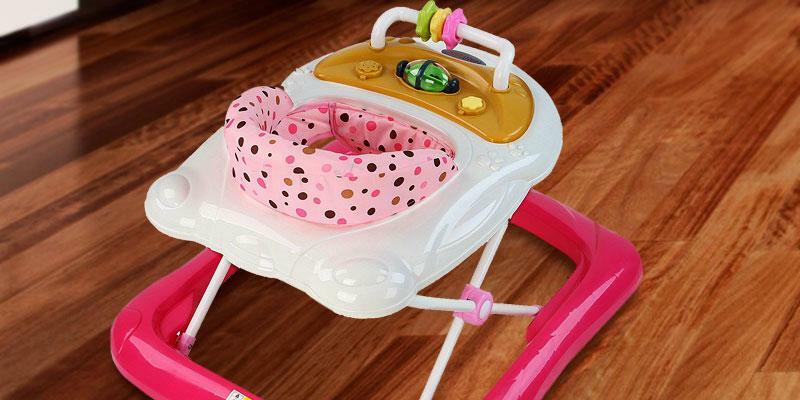 Admit, cars are one of the favourite children toys, and it's no wonder that My Child Company has designed a car baby walker. 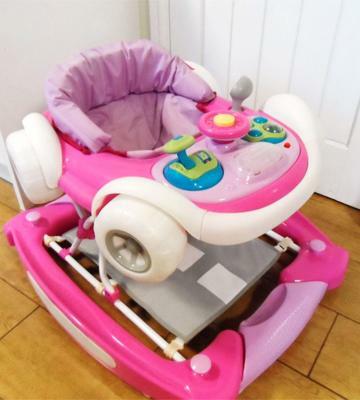 An interactive steering wheel, a gearbox, a rear-view mirror, large wheels, and a footrest pad with the road print allow your toddler to learn more about cars and even make the first "beep beep". 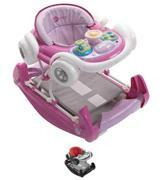 Besides these visual effects, the walker produces sounds which not only entertain but also develop your kid. 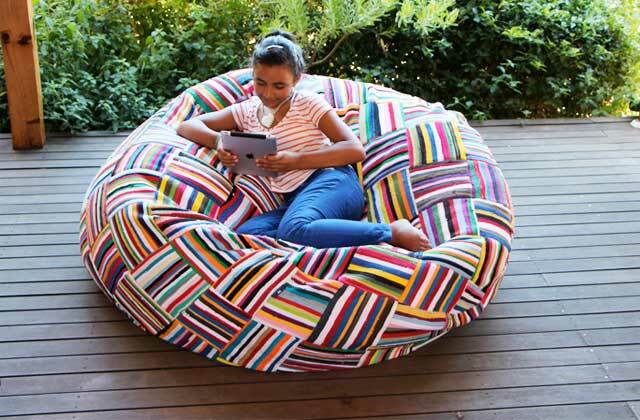 Yet, its foremost function is to enable a child to move freely around while sitting upright. Also, you can choose a static mode by applying the footrest pad. 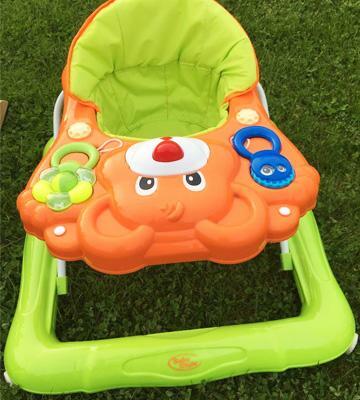 Or you can turn the base into a rocker, and let your toddler enjoy calm rest. Whatever position you choose, don’t worry about your child’s safety as no-tip pads will protect your little driver and prevent him/her from falls. However, toddlers can be too curious, so for better protection, you might need baby gates. We dare suppose that most parents look for multifunctional furniture for nursery rooms. If you're the same, you may as well be interested in the My Child Walk-n-Roll baby walker which combines way more useful functions than walk. Firstly, it offers the functionality of a classic seat-based walker; yet, on pressing only two buttons and turning the base you can easily transform it to a rocker and entertain your child in that way, improving his/her vestibular system at the same time. In a rocker mode, according to many parents, a child masters walking much quicker too. 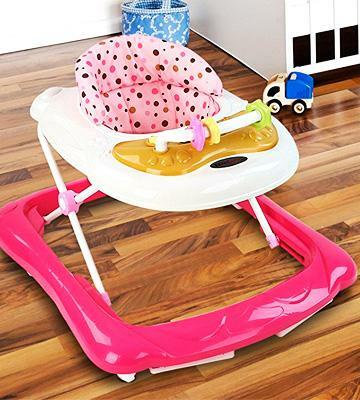 To keep the walker in one place so that it doesn't roll over the flooring, you only need to install a footpad and your kid will be able to keep playing with toys in the same place where you set it. 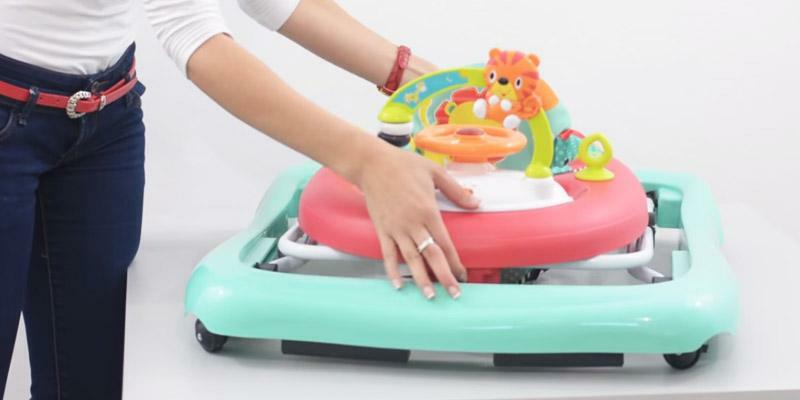 The My Child Walk-n-Roll baby walker features a great removable interactive panel that you can either let your child play with or simply remove and put somewhere else, on a table, on a couch, on the floor, etc. Without the panel, the walker can serve as a feeding table. 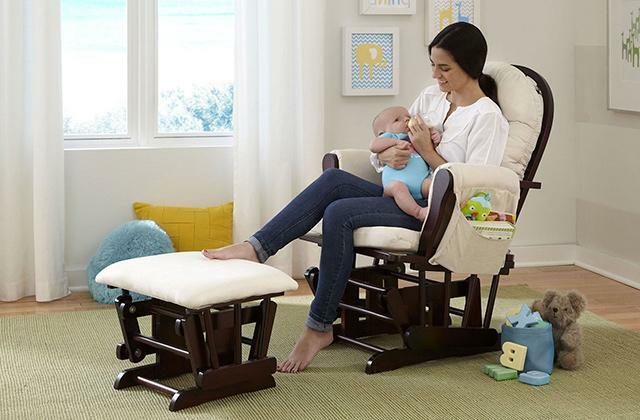 As you can see, the functionality of this walker is truly fantastic and easily makes it a useful and functional piece of furniture that can help your baby make the first steps and sit straight firmly. A baby gym will become one more helpful purchase to develop your kid's creativity and imagination. Designed in bright green and orange colours with a bear-like toy tray, the Bebe Style Baby Walker won’t leave children indifferent! Its "teddy" tray will definitely attract your kid’s attention, while sounds and activities will develop your child’s perception. Plus, the tray is equipped with a blue teething toy that will come in handy when your kid starts to experience a teething period. 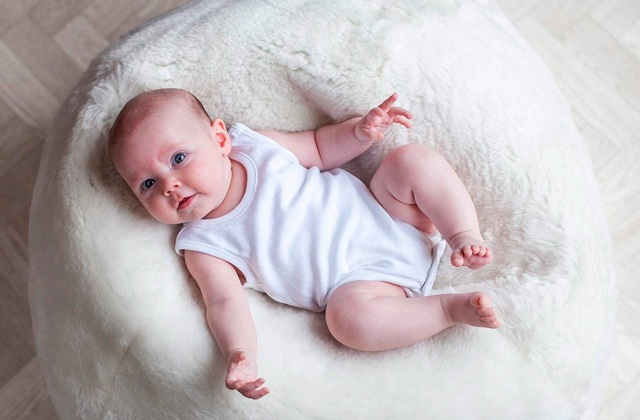 Parents will also appreciate a rigid backrest and padded abdominal protection which both guarantee additional support for 6-, 7-month babies who have just learned to sit straight. Finally, you’ll be pleased to find out that this walker has been tested and it meets all UK and EU Safety Standards. Thus, by choosing the Bebe Style Baby Walker, you'll provide your toddler with an interesting, useful and safe piece of furniture. Baby monitors are the devices offering you an opportunity to keep an eye on your child even from another room. If you’re looking for a budget-friendly yet functional baby walker, we recommend you to consider the Infantastic First Steps product. Like the majority of modern walkers, it is equipped with a tray of toys to entertain your child. Rotating toy accessories with sound effects will definitely captivate your kid, giving you some time for yourself. Besides being fascinating, this walker is also totally safe - 6 anti-slip pads on the feet will protect your little explorer from accidental falls. Due to the walker’s folding design, you are free to use it at home or take it with you to a grandma's house. 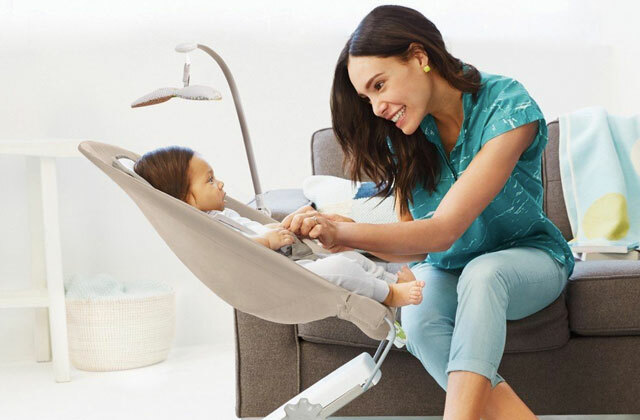 Once folded, the walker is pretty compact and light.Removable washable inserts ensure hassle-free cleaning, thus, simplifying the life of young parents. What else is worth mentioning is that you can choose between 4 colours - blue, pink, red and purple. Sometimes you just need your baby to be around while cleaning the house or drinking tea. 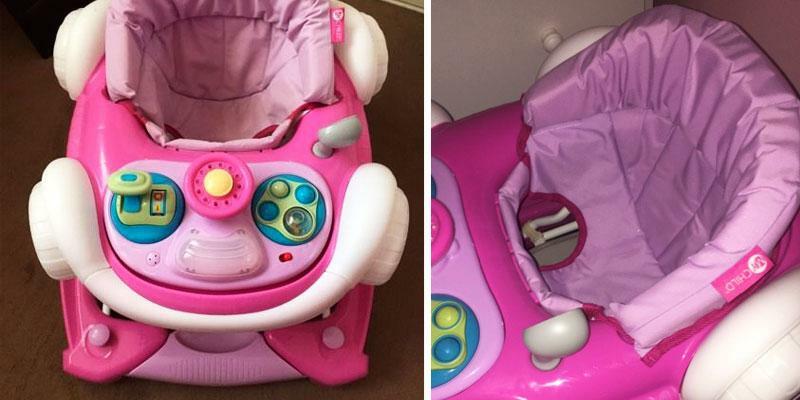 Put your baby in a baby bouncer and keep your peace of mind. Bright Starts is a lightweight and yet, well-built walker, suitable for both, infants and growing tots. 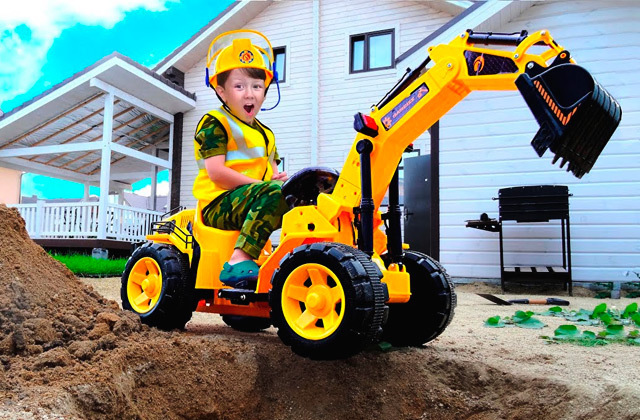 The height of construction is easily adjusted to three positions so basically, it’s made to grow with your child. Bright Starts Walk-A-Bout Walker is mounted on a wide base that prevents bumping into the furniture, and fixed on sturdy swivel wheels that easily maneuver on carpets and uneven surfaces. 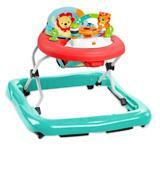 This is a beautifully built baby walker available in multiple colors, great for both, boys and girls. It’s gonna be good for both, small kids and growing tots who’ve already learned to raise up on their feet. The height of the legs is regulating with accordance to the height of a kid so that a child can reach the floor and comfortably work around the house. You would have no need to worry about leaving a child in this walker. 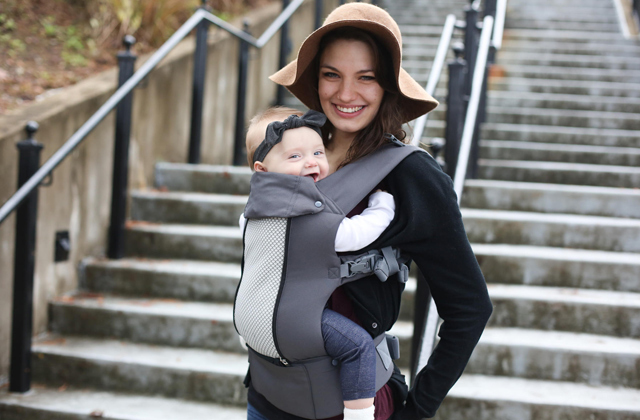 Its wide lower base is made in a way to keep a little one in a safe distance from dangerous things. While colorful design of Bright Stars Walk-A-Bout Walker is great on its own, it’s got some other very nice features that your kid will definitely love about it. The walker is equipped with an amazing playing panel and a few attached interactive toys. The best thing about it is that the panel is removable and can be used separately on the floor along with other kid’s toys. If you belong to those customers who believe that interactivity is a useless and costly zest, you should get this walker and see what it does to child’s activity. 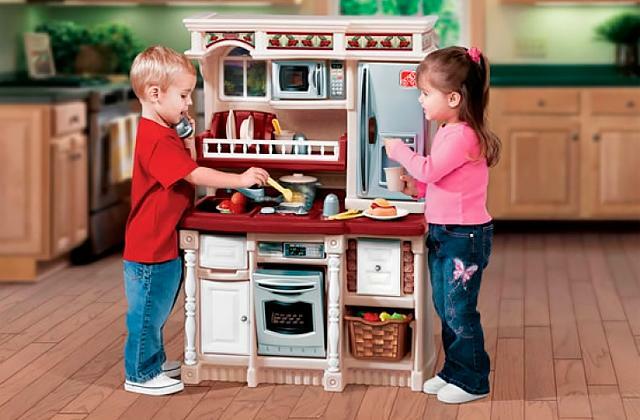 Your little one will absolutely be delighted and excited to move around together with the lit up toys. A baby walker is a special vehicle designed for infants who are just about to make their first steps. Most baby activity walkers are based on a plastic frame with swivelling wheels that move around the house when a baby steps forward. It’s one of the best ways to entertain a baby and give a child some kind of mobility whilst he or she cannot walk on his/her own. 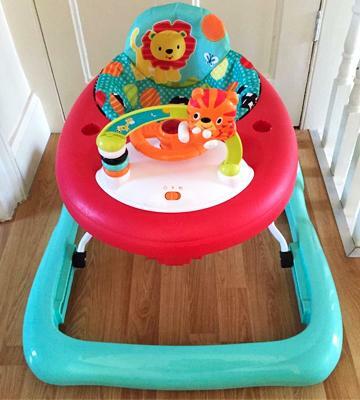 Parents love the fact that baby walkers are equipped with music and colourful attached toys that not only stimulate a child to move, but also keep him or her entertained for quite a while. Since the 1440s when a baby walker was introduced to the people for the first time, it’s become a very popular baby product, frequently bought all over the world. To help your little one fall asleep fast after an active day, a baby swing will come in handy. 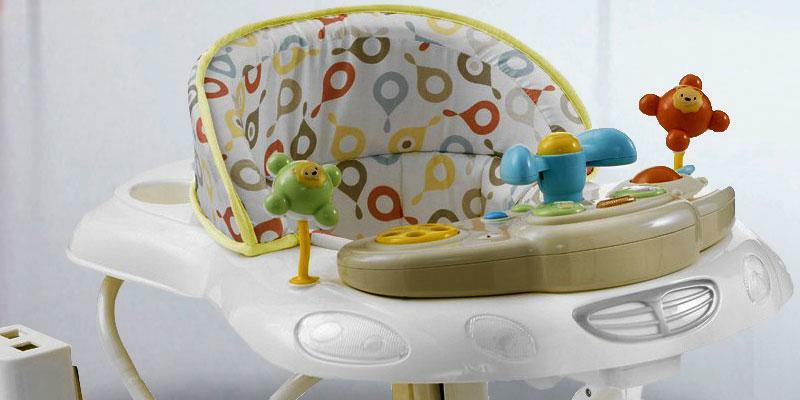 And baby high chair will become the first kid's furniture where he/she will spend time eating, playing or even learning! The foremost thing most parents pay attention to when they go to the kids’ shop is a variety of toys and colours for sale. They find it difficult to hold back and not pamper a little one with a new lovely doll or a teddy bear. 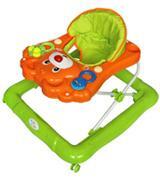 The same goes about baby activity walkers. Most of them look pretty similar. 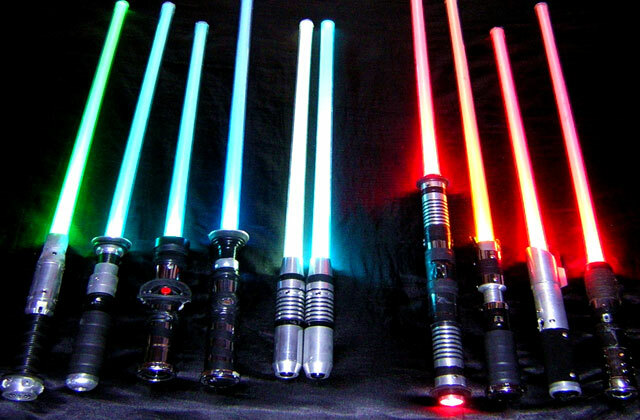 They are bright in colour and equipped with some interactive panel. From the first sight, you’d struggle to spot a difference. However, there are certainly a few important things worth knowing before buying the one. 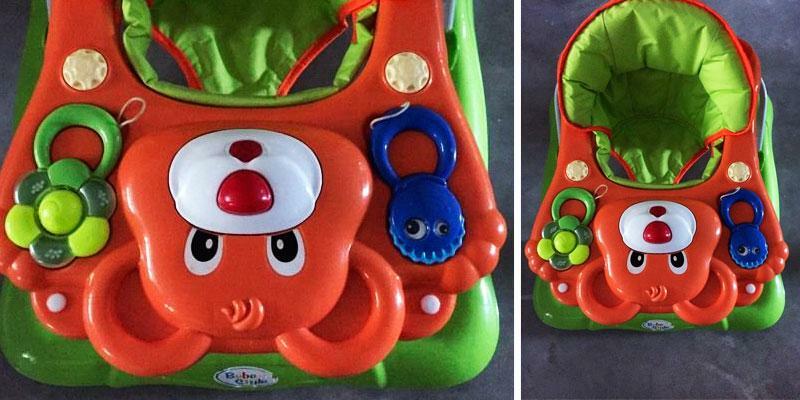 There are two types of baby walkers for babies - with a seat and without it. The Construction of the first one is designed for infants who can’t walk on their own. Sitting in a seat, a little baby will have an option to navigate around the house and have a rest whenever he or she gets tired. The second type is designed for older kids who can already walk on their own but for some reason lack confidence and stability. 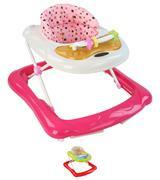 Such baby walkers will quickly learn them to keep the balance and confidently walk. We’d also like to draw your attention to the Safety Options and Fit that a baby walker provides. 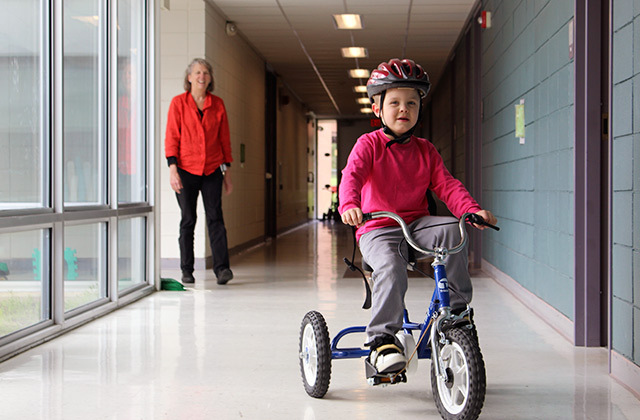 The width of a seat, the height of construction and wheels are all those criteria that determine how sturdy or not a walker would be. Look for the unit equipped with the clamps. This is a small, but important detail that ensures safety of a child on the go. A lot of parents attach significance to Interaction Features aimed to entertain a kid. There’s a big variety of toys and buttons attached to the walker that would certainly come to liking of a child, however buying a walker with all bells and whistles may become a serious problem later on. Soon you may find out that your child refuses to move on his or her own and spends too much time in a seat (which can negatively affect his/her health). We’d recommend you to seek for a golden mean - something interesting but not that much to discourage a child from any self-activity. 1. Choosing a Baby Walker, Bébé Confort. 2. 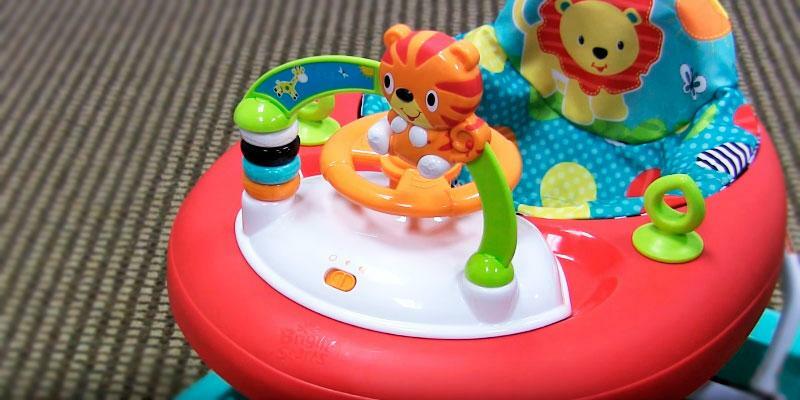 Anna Studman How to Buy the Best Baby Walker, Which? 3. Rose Erickson Baby Walkers & Development, LIVESTRONG. August 22, 2015. 4. Baby Walker, Wikipedia. October 23, 2016. 5. How to Choose a Safety 1st Baby Walker, eBay. March 3, 2016.